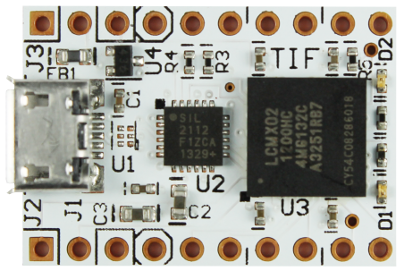 The tif board is coin sized at 1"x0.7" (25x18mm). Despite the size a tif is a complete system with a powerful FPGA and a hard coded USB HID interface for programming, communications, and control. An instant-on, non-volatile, high performance FPGA is a perfect target for experimenting with FPGA design, for developing design options, for implementing your own custom chip. A USB HID interface means that the tif board will work without special drivers on any Windows, Linux, or Mac computer. specialist resources such as SRAM blocks, PLLs, and hard-coded I2C/SPI communications channels. For the tif board, simulation and compilation software is a free download from Lattice Semiconductor. We supply Python software to inject the bitstream into the FPGA. FPGAs come in a huge range of sizes, with the latest and greatest FPGAs typically costing as much as a small motor car. Since an FPGA LUT is approximately equivalent to a 10cm (4") square logic board with four TTL logic packages, the 1280 LUTs in the smallest tif board are equivalent to a wall of logic measuring 350cmx350cm (140"x140"), more if SRAMs, PLLs and so on are included in the calculation. tif-1200, including software: $24.99 - the tif-1200 has a Minimum Order Quantity (MOQ) of 20 boards. Contact sales to order this product. Windows XP, Vista, 7, or 8. Or Linux. Download the software bundle from the Github repo here. Please note that the tif board is designed for users who are familiar with electronic design and debugging, and familiar with the usual safety precautions when working with electronic equipment.